Hello Friends! Today I am sharing how to make a “Beans, Greens & Grains Bowl”. I eat this meal, or a variation of this meal (using different greens, beans and grains), multiple times a week! You can watch the how-to video and get the recipe below. I hope you give it a try! Comment below and let me know if you do! Cook brown rice on the stovetop first. To make 1 cup of cooked brown rice, combine 3/4 cup water with ¼ cup dry rice in a pot. Bring to a boil on the stovetop then reduce the heat, cover with a lid and let simmer for 45 minutes or until the rice has absorbed all of the water. While rice is cooking, drain and rinse black beans. Add black beans to a stovetop pot and cook on medium heat, stirring occasionally. While beans are cooking, wash and devein kale. Then, add water to a stovetop pot and place kale in a veggie steamer over pot of water. Bring water to a boil and let kale steam. 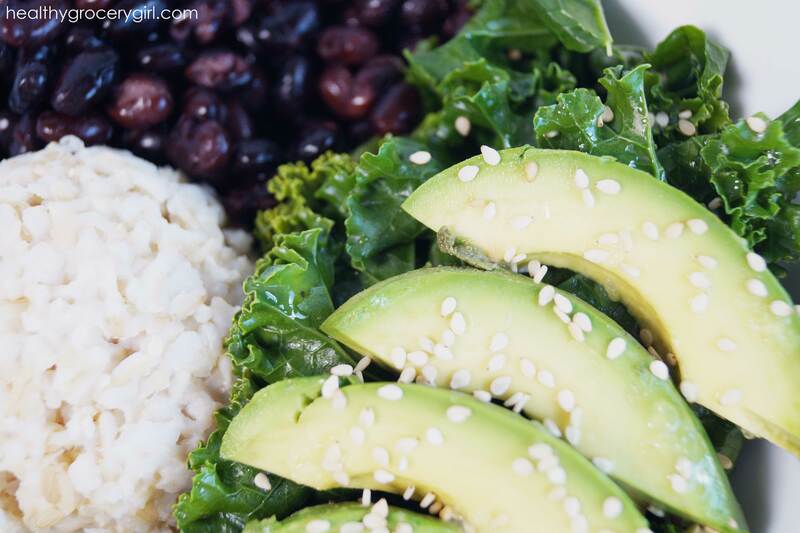 Add all ingredients to a bowl, top with slices of avocado, sprinkle with sesame seeds and drizzle with coconut liquid aminos (a soy-free low sodium soy-sauce alternative).